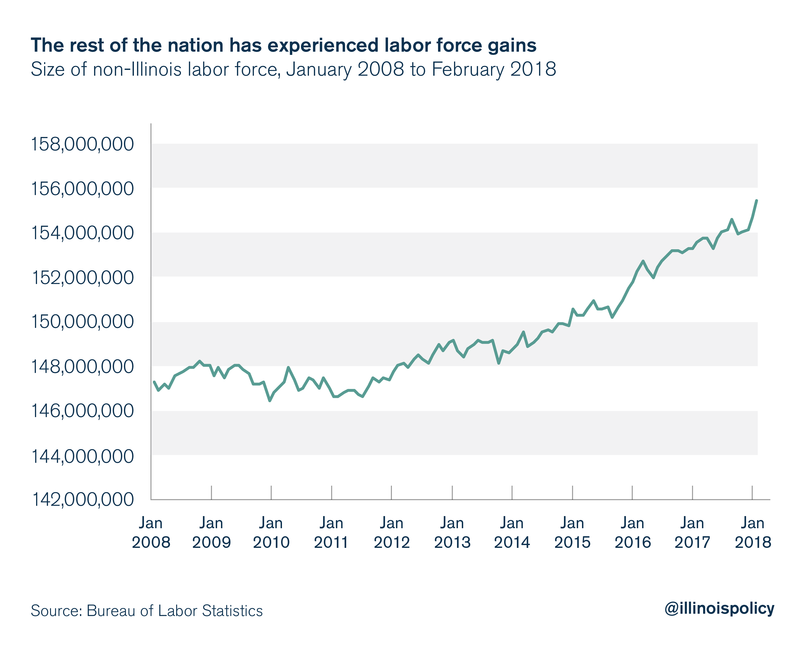 The Illinois Department of Employment Security released its monthly statewide employment data April 19 in conjunction with the Bureau of Labor Statistics. And unfortunately for the Land of Lincoln, the state couldn’t recreate the robust employment growth experienced in February. Instead, Illinois lost 2,100 jobs over the month of March. 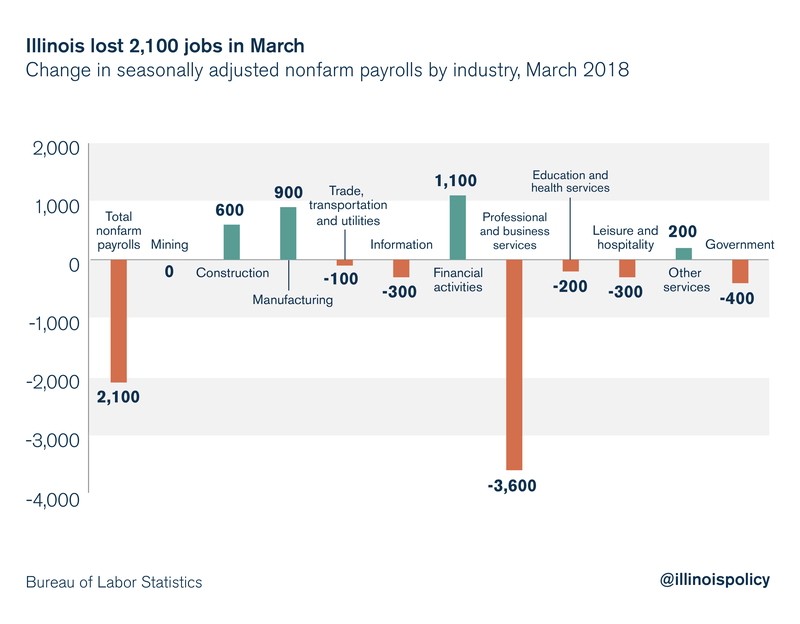 The professional and business services sector drove the vast majority of Illinois’ jobs loss over the month, shedding 3,600 jobs, a decline of nearly 0.4 percent. Some sectors did experience growth over the month however. Financial activities added 1,100 jobs (+0.03 percent); manufacturing added 900 jobs (+0.15 percent); construction added 600 jobs (+0.27 percent); and other services added 200 jobs (+0.08 percent). The mining sector saw no change in payrolls. Illinois’ unemployment rate continued to drop in March, and the number of unemployed individuals was at its lowest point in over a decade. This seems like good news, but it’s not. The drop in the unemployment rate and the decrease in the number of unemployed individuals in March was wholly a result of labor force decline. This is not cause for celebration. 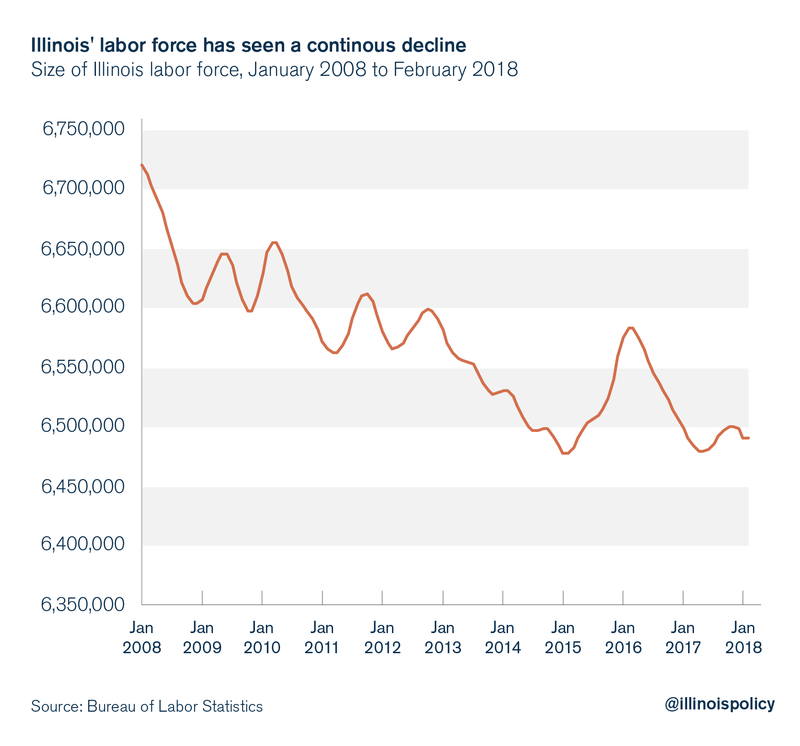 Since the end of the recession in 2010, Illinois’ labor force has declined by more than 137,000 people, a 2 percent slide. This is in stark contrast to the rest of the nation, where the labor force grew by more than 8.5 million over the same time, or 5.8 percent. Illinois needs drops in unemployment levels and the unemployment rate to stem from Illinoisans landing jobs, not because the market is so barren that they give up or move elsewhere. Improving Illinois’ labor market requires fiscal solvency and the assurance that taxes will not be hiked each year. Illinoisans deserve a state where they can find jobs and flourish. In addition to providing a path toward that tax relief, a spending cap would be a strong signal to creditors that Illinois wants to get its finances in order, thus potentially improving the state’s worst-in-the-nation credit rating. If state lawmakers could only do what many households manage every day – to spend within their means – they would soon see more investment flowing into the state to spur job creation and economic growth. Ultimately, the only way to get lower taxes is to rein in government spending at the state and local levels. Illinois should look to states such as Virginia for ways to cut spending without harming the delivery of core services.